Preheat oven (or toaster oven) to 200 F, have a baking sheet & aluminum foil ready to keep cooked pancakes warm in the oven. In a large bowl, mix together the dry ingredients. In a separate bowl (I use my 2 C measuring cup & whisk), mix together the wet ingredients. Add the wet ingredients to the dry ingredients. Whisk these together until just moistened. *Do not over-mix; a few small lumps are fine. If you over-mix, the pancakes will turn out stiff and rubbery. Heat a large skillet or griddle over just-below-medium heat. Oil the pan if necessary to prevent sticking. For each pancake spoon 2-3 tbsp of batter onto the skillet. While the bottom side of the pancakes are cooking, add any extras such as chocolate chips, strawberry pieces, bananas, blueberries, etc. 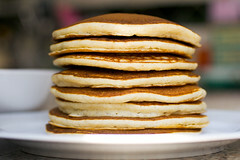 Cook until the surface of pancakes have some bubbles and the edges look dry—1-2 minutes. Flip carefully with a thin spatula and cook until browned on the underside. Transfer the pancakes to the baking sheet in the oven or put them on a plate and cover them with aluminum foil. Serve warm with assorted toppings.